We understand that such a big treatment can leave you with a lot of questions. Below are some of the most frequently asked questions and concerns patients have about dental implants. Please click on a question below for the answer. Got more questions that our FAQ didn't answer? Visit our Contact page & schedule an appointment today to see Dr. Mike Chen at one of our locations. A: A dental implant is a small titanium screw that serves as the replacement for the root portion of a missing natural tooth. Dental implants can be placed in either the upper or lower jaws. Due to the biocompatible properties of titanium, a dental implant fuses with the bone and becomes a good anchor for the replacement tooth. Dental implants can be used in solutions for replacing single or multiple missing teeth. A: The fee for tooth replacement with dental implants depends on several factors, including the number of teeth being replaced and the number of dental implants required to support your replacement teeth. Some additional procedures may be required prior to the placement of your dental implants to ensure the long-term health of your dental implants. To obtain a specific fee estimate, it is necessary to have a doctor examine your mouth. After a thorough diagnostic examination, your dentist will recommend the treatment that is best for you. 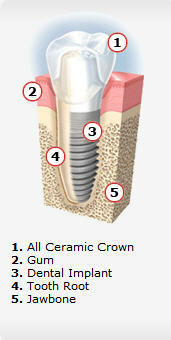 A: Anyone who is missing one or more teeth due to injury, disease or tooth decay may be a candidate for dental implants. The determining factor is the amount of available bone. Your dentist is the best person to evaluate whether dental implants are a viable solution for you. Q: Is old age a problem? A: Occasionally, older patients express concern that their age may prevent them from enjoying the benefits of dental implants. However, health is more of a determining factor than age. If you’re healthy enough to have a tooth extracted, you’re probably healthy enough to receive dental implants. Certain chronic diseases may contraindicate dental implant treatment. Your dentist will determine if you are a candidate for dental implants after a careful evaluation of your dental and health history. Q: What are the advantages of dental implants over dentures or a dental bridge? Q: Will my new teeth look natural? A: When dental implants are used in combination with modern restorative dentistry, their appearance, comfort and function are very likely to exceed your expectations. Often they are hard to tell apart from your natural teeth. Q: Will I be able to chew with the same force and pressure I use with my natural teeth? A: Yes. Following a brief adaptation period, chewing capacity is comparable to that of natural teeth. Q: How much time is required for a dental implant placement? A: With any surgery, there can be some discomfort. Placing one implant normally causes less discomfort then placing several. Anesthesia and patient sedation are commonly administered to help reduce any discomfort during the dental implant process. Most patients report that they were much more comfortable following the procedure than they had anticipated. Your doctor will prescribe medications to ease any discomfort that may occur. Ask your dentist to recommend another patient who has already had tooth replacement therapy to assess their personal experience. Q: How will I feel after the treatment? A: It is normal to have some bruising and swelling in the gum and soft tissues. But usually the discomfort, if any, is treated with an ordinary painkiller. You should expect to be able to work the next day. Q: How will I care for my dental implants? A: Your new teeth must be cared for and checked regularly, just like your natural teeth. Brush and floss as recommended by your dentist or dental hygienist. See your dentist in six months, or more frequently if so advised.